As a kids we had it pretty good, my Memere always had the most spectacular garden. It might not have been a whole acre, but my goodness, when I was a kid, it sure felt like it! Memere always shared her bounty both fresh and canned; spicy spaghetti sauce, canned peaches and pears, jams, pickles. And my favourite: pickled carrots. You name it, we got it. One of my favourite things was always the couple of rogue carrots that snuck into the jar of pickles. 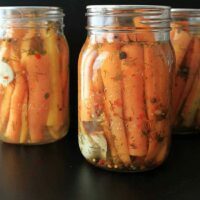 The pickled carrots with the tender-crisp carrot texture, the strong garlic and dill flavours, the mouth watering vinegar. I could almost drool just thinking about it. You could try to argue with me that the garlic is the best part, or the actual pickles, but you’d be wrong. The pickled carrots are where it’s at. This year, Mom planted a beautiful and bountiful garden of her own. Apparently, green thumbs run in the family. Hopefully I’ve got it too…. Anyways, Mom’s garden is gorgeous and full and spitting out produce at an alarming rate. Every time I go to visit, she sends me home with bushels of food. This was part of the haul from a quick visit on mine and Kevin’s anniversary. Needless to say, we literally cannot eat all the produce that’s given to us fresh. 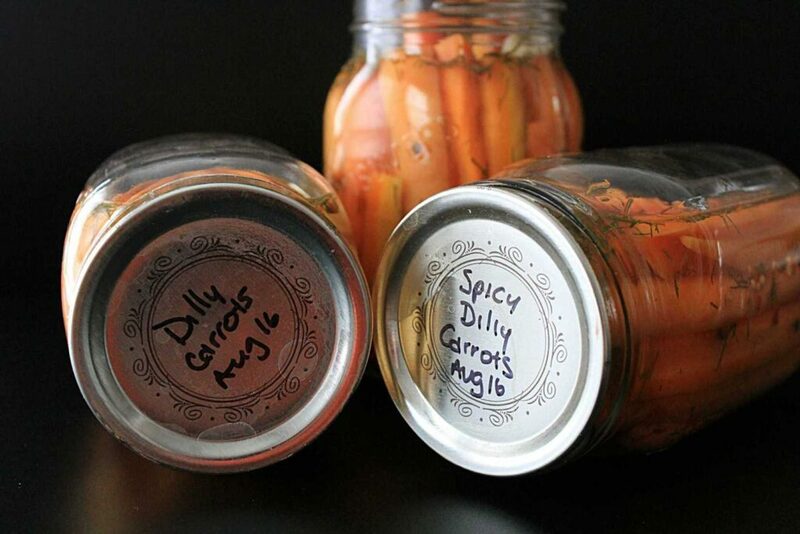 I decided to make some pickled carrots, and why stop there… I decided I should make some spicy ones too! The worst part about canning pickles – you have to wait to try them. It’s a major bummer. So here I am crossing days off the calendar before we’re able to crack open one of these jars. Memere said I must wait 4-6 weeks. She knows her stuff. So I’ll hang tight, in misery until then. Prepare jars and lids by washing in hot soapy water and then place on silicone mat lined baking sheet in oven at 225f until ready to use. Fill water bath canner enough to cover jars and begin to heat. In a large pot, add brine ingredients - bring to a boil, then reduce heat to a simmer. Meanwhile, slice carrots to desired size and prep ingredients for jars. 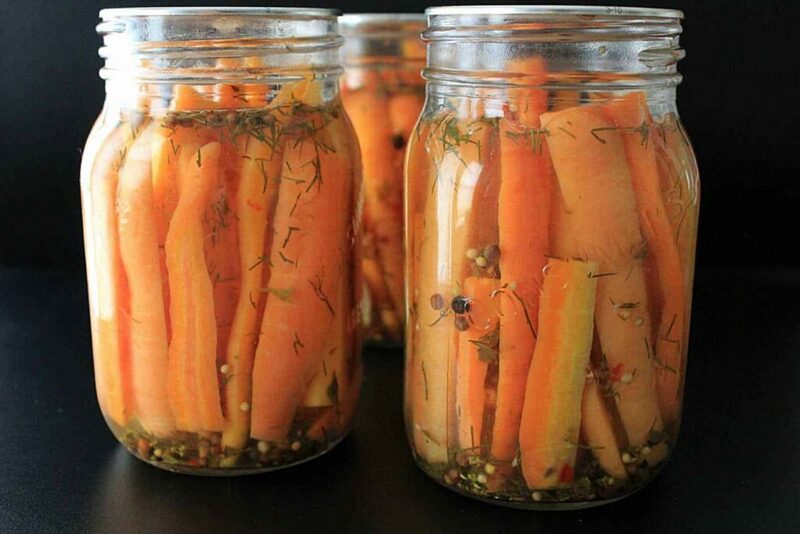 Remove jars from oven and stuff with carrots, while hot, and fill with brine leaving 1/2" headspace. Wipe the rim of each jar before sealing with a hot lid. Screw bands on finger tight - I usually spin them until the jar starts to turn with the lid, then back off 1/8 or so of a turn. Carefully, using jar lifters, place filled jars into hot water bath canner and bring to a boil. Process at boil for 15 minutes. Remove from water bath canner and cool untouched for 24 hours before moving to a cool, dark storage spot. Store for 3-4 weeks before sampling! Is it OK to use sea salt and regular vinegar? And what are the pickling spices? HI Dee, I’m sure you can use sea salt, pickling salt is just more economical when you’re using large quantities, as in canning. You can definitely use regular vinegar, I prefer pickling vinegar because it’s got a bit more acid content in it and it gives a bit more tang. I found a small bag of pickling spices at my grocery store, they are very similar to this one I found on Amazon! I would love to try this recipe but instead of the red pepper flakes add some jalapenos! I think it would add a nice heat and tangyness that would be a nice contrast. Thank you for sharing this recipe! That sounds amazing, Billy! Let me know how it turns out if you try it! What size jars for this recipe? I used half pint, so 500ml jars! do you peel the carrots? did you use your pressure canner? or a regular hot water bath canner? Hi Natalie, I water-bath canned these guys! Hi Ally. I’m concerned I used a recipe for pint jars (500mls) , that asked for 1 Tbsp. Picking spice along with dill and garlic cloves. Yesterday. ….after the water bath , one jsr didn’t seal. …so for curiosity’s sake I tasted it! I couldn’t believe how strong it tasted. ..awful! LOL This isn’t your recipe. Just concerned that the recipe asked for way too much Pickling spice. What do you think? And if so….anything I can do about it? Thank you! Those sound amazing! I will keep my eye out for something similar – but now I am tempted to recreate that recipe! Oh please do! They taste out of this world!! Nice heat, some sweet and the carrots were crunchy, everything just worked!! Do these last for a year once they are processed? Hey Lindsay! Mine definitely do! They may be a little softer near the end of the year but they are still top notch! I served some from last canning season this christmas and they were still excellent! I have just made these using your water to vinegar ratio but I am concerned if it is correct. 6 cups water to 2 cups vinegar. I am using 5% acetic acid but your recipe calls for 7.5%. Will my batch be safe? I have been looking at other recipes and vinegar content is higher. I am new to this so please advise whether I should keep in fridge vs pantry. Hey Heidi, sorry for the delay. I can’t guarantee they’ll be safe but I’ve adapted this recipe (and kept that ratio the same) from my 90 year old Memere – I can safely say that none of us have been sick! Hi! 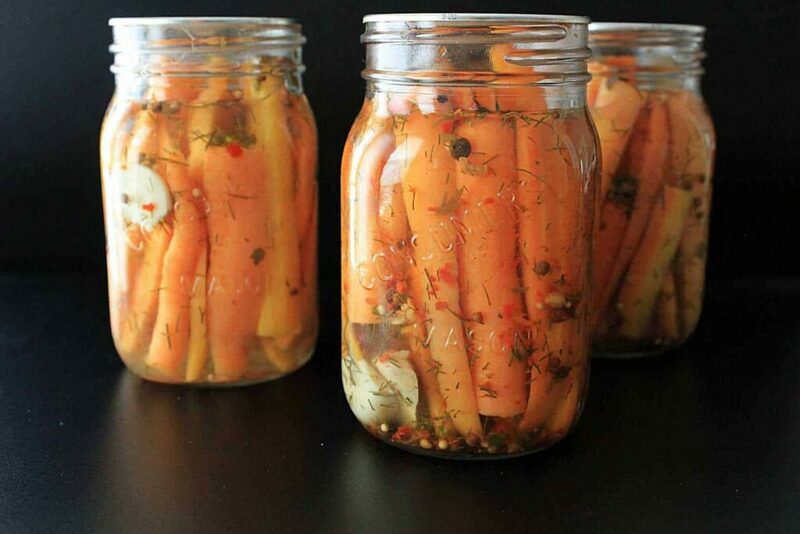 I just used this recipe to make some pickled carrots and cucumbers. I was researching other recipes and noticed that the typical ratio is 1 cup water: to 1 cup vinegar vs this recipe which is 3:1. I put all of the pickles in the fridge – but do you have any ideas if this at risk for botulism? My vinegar was 5% also. I did water bath 10 mins for each can. Any help would be awesome! I think I am ok- but worried and think I might throw out all the food and redo again with 1:1 ratio? Will these carrots have a crispy crunch or will they have a flimsy bite. I’ve never tried dilled carrots. I’m interested in trying out this spring. Hi Rita, they’ve got a nice crunch! Nothing worse than a floppy pickle!